An easy way to reduce outage window for PostgreSQL Upgrade! PostgreSQL 9.2 release provides lots of great features. Recently, one of the clients at OmniTI required upgrade of their couple of PostgreSQL production databases running on PostgreSQL version 9.0 to PostgreSQL 9.2. The client is running database servers on Amazon EC2 instances. For the failover purpose, they run 3 instances in the setup, one instance is master database and next two instances are slave of master database. Alike others, they were looking for zero outage solution for PostgreSQL upgrade but unfortunately there isn’t one exist now! Whenever, the upgrade requirement with minimum outage come to us, we always check option #2 . pg_upgrade provides ability to upgrade database without dump/restore all the data. Unfortunately, pg_upgrade –check test failed because the databases are using ltree data type. One of the limitations of pg_upgrade is that it does not work if the ltree contrib module is installed in a database. Meanwhile, the requirement came from client that they want to consolidate both environment into one server so eliminate cost and maintenance for running 6 instances for 2 production databases and similar number of instances for stage environments. This new requirement eliminated option of even think about using pg_upgrade. Next option is to optimize dump/restore process in such a way that the total outage window can be minimized. I started collecting stats about their database size and large tables in the database and dump/restore timing. Both of the above estimations are providing accurate dump/restore timing because I ran dump on existing prod servers and restore on proposed new server. I could use Slony or Bucardo replication systems for replicating tables for upgrade purpose but even though Slonly/Bucardo systems are around for a while , they are very complicated to setup, manage and debug in-case of the problems. It might be only me but I did not want to introduce complex replication system for upgrade purpose! For X DB, top 2 largest tables are Insert only tables. yay! No Foreign Keys on the tables for both databases. So, I started looking into Simple table level replication options. Let me make it clear that table replication still works with FKs but its is important to know because I don’t have to worry about disabling foreign keys during replication at table level and enable later. I didn’t have to look far because Keith Fiske,one of my colleagues, recently came up with Mimeo extension. Mimeo is very simple OmniTi’s home grown replication system for replicating databases at table level over dblink between two PostgreSQL databases. Usually, Mimeo helps us replicating production instance to DataWarehouse system but in this case I decided to give a try to use for replicating tables temporarily during upgrade process. Inserters : Replicate Insert only tables. Updaters : Replicate tables based on updated_tsz. You could place trigger on source table on production to keep the updated_tsz updated but most of the times your application is already taking care of. This replication method does not support DELETEs on tables. DML: This method supports Insert/Update/Delete on the table but the table should have Primary Key to keep track of the changes. Mimeo places trigger on source table on production database to keep track of rows into mimeo.tablename_pgq tables . A pull request from destination (replicated) table to fetch these rows from queue table to grab latest data only for changed rows and apply them on destination table. Snap : Grab entire table from source table and truncate destination table to refresh completely. it’s very useful method for small tables. That was brief overview of the Mimeo. The tool is still under development and looking for more testers and contributors. For now, Let’s get back to upgrade ! First production environment was easy because there are only 2 large tables and both are INSERT-only tables. After you have packages installed for dblink, jobmon and mimeo , you could install them into database as extension. Freeze schema changes on X DB production database server running on PostgreSQL 9.0. Setup Mimeo replication for t1 and t2 tables using refresh_updater method. pg_dump all but t1 & t2 tables data and pg_restore with 4 parallel processes (-j 4) on PostgreSQL 9.2 with (~15 minutes). To expedite the restore process, I dropped indices on couple of large tables before the restore and put it back after the restore. Open up upgraded database for applications!! Keep in mind that only step 5, 6 & 7 needs to be executed during outage period. The total outage for upgrade of this production database environment was ~ 15 minutes . Second production environment is using same PostgreSQL cluster on new database server but different database name. This database is larger than first one and have more tables with all kinds of transactions. I followed same procedure to install mimeo on this database as described above but for DML replication you need to execute an extra step by creating mimeo schema on source (production database server running on PostgreSQL 9.0) with proper permissions for mimeo replication role. All _pgq tables and trigger functions on source tables reside under this mimeo schema on source database. Freeze schema changes on Y DB production database server running on PostgreSQL 9.0. Setup replication trigger on DML group replicated tables using mimeo.dml_maker function by executing on PostgreSQL 9.2 database server. Setup Mimeo replication for t1-t3 using refresh_updater and t4-12 tables using refresh_dml. I did not setup replication for static tables. pg_dump all but t1to t17 tables data and pg_restore with 4 parallel processes (-j 4) on PostgreSQL 9.2 with (~5 minutes). Open up upgraded database for applications !! As above, only steps 7-10 need to be executed during outage period. The total outage for upgrade of this production database environment was about 15 minutes. In conclusion, Mimeo helped our client to upgrade their database servers with minimal outage. Hopefully, it will help you on your next production database upgrade to reduce outage window. 2 Elephants in the Room!! Yesterday, I gave a lightning talk at Hadoop DC- Hadoop User Group (HUG) in Columbia,MD. It was pleasure to talk about PostgreSQL and Hadoop to enthusiastic crowd. Please check out the slides! Today, I gave talk on “Deploying Maximum HA Architecture with PostgreSLQ” at PG Day New York. You could check out slides here ! 2 PG Days in 2 days apart !! I will be attending both of the these days. If you are attending, will love to meet you in-person. br /br /See you soon!! 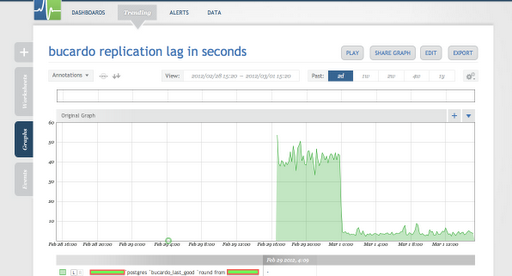 I have been using circonus for monitoring, trending and alerting for any database metrics for quite a long time now. The circonus interface makes the monitoring, trending and alerting setup painless and you can see graph flowing in minutes. Another good thing about Circonus is that you can monitor anything that you can query from database ! This week, the task at my hand was to find a way to monitor bucardo replication lag. `bucardo_ctl status sync_name` provides very important information that you can rely for trending and alerting purposes. All the information provided by `bucardo_ctl status` command is important but most interesting thing to monitor is “Last good:”. Last good shows bucardo replication lag on slave server. Now, I have metric identified for the monitoring. Next step is to find the best way to put the metric into the monitoring tool. After some poking around the output and ways to monitor stuff, I decided to grab the SQL query from bucardo_ctl perl script and stick it into circonus monitoring. Most of the time spent for setting up this monitor was to grab right query from big perl script (bucardo_ctl) and mapping the metric required from the query. After that, here is the query that I plugged into Circonus in no-time. bucardo_ctl status shows Last good status to “unknown” if replication is broken. In circonus, you could setup rules and relevant severity levels. The most important part is that if the query doesn’t return any row it should page(“unknown” condition) . Circonus provides rule for alerts in case of a metric is absent. Now, I am all set with alerts as well. Yay! bucardo replication is under monitoring and trending without any hassle! Hopefully, this post will help you next time when you try to put bucardo replication lag under monitoring. By end of this month, I am completing 5 years with OmniTI. Before joining OmniTI, I was an Oracle DBA and worked mostly with closed source databases. I am grateful & fortunate that Theo and Robert provided me opportunity and guidance to work and contribute with open source technologies and most importantly an open source database PostgreSQL ! At OmniTI, if you don’t have hesitation to learn new technlogy, you will have smooth learning experience alongside working with your known technology for the clients. Most importantly, you can have access to technology leaders in the office. Ironically, I never worked for single company longer than a year before joining OmniTI in my career but now I am looking forward to learn and contribute to FOSS community working with OmniTI. Since joining, I haven’t spent a day without learning a new thing . Are you bored at routine work? Come join OmniTI’s adventure, here I work! Bravo to OmniTI & PosgreSQL and FOSS community!! In my recent blog post, I wrote about PostgreSQL DBA Handyman toolset. In the list of tools, getddl is one of them. If you are using getddl to get DDL schema and track the daily changes in SVN for production databases, you should consider moving that process to use pg_extractor instead. pg_extractor is the more advance and robust tool for extracting schema as well data using pg_dump. Keith Fiske, an author of the tool, described tool in detail in his blog post. Thanks to Keith for making the schema extraction tool more robust and taking it to next level ! Hopefully, it will help you to have more control over your database in smarter way!